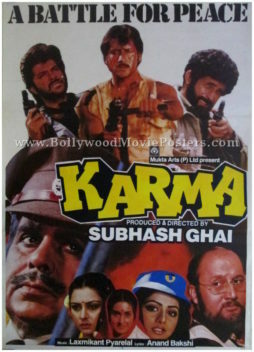 Bollywood poster of the blockbuster Hindi film Karma (1986) for sale. Featured here for sale is a Bollywood movie poster of the 1986 film directed by Subhash Ghai that featured a stellar star cast comprising Dilip Kumar, Nutan, Naseeruddin Shah, Jackie Shroff, Anil Kapoor, Poonam Dhillon, Sridevi, Dara Singh and Anupam Kher. Karma was the first film that paired Dilip Kumar and Nutan together. Printed and circulated several years after the first release of the film (somewhere in the late 1990s), this Karma movie poster was originally designed for publicity of a subsequent release of the film but never ended up being used. This old Dilip Kumar movie poster features an interesting photographic collage of the leading characters of the film. The premise of the film is captured with a line on the top that reads, “A Battle For Peace.” Anil Kapoor, Jackie Shroff and Naseeruddin Shah are seen holding guns on the top of the poster. A large photographic close up of the ultimate method actor of Bollywood, Dilip Kumar is seen on the bottom left. Anupam Kher who plays the unforgettable villain, “Dr. Dang” in the film is seen on the opposing side of this Karma movie poster. Smaller stills of Poonam Dhillon, Nutan and Sridevi are seen at the bottom. Songs from the film such as “Aye Watan Tere Liye” and “Aye Sanam Tere Liye” have become unforgettable classics. 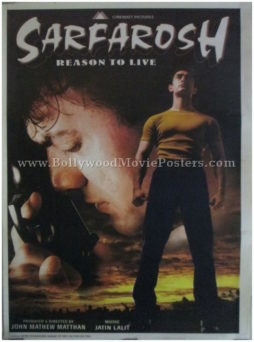 Classic Bollywood movie poster of the memorable old Hindi film, Sarfarosh (1999) for sale. This is an actual surviving classic Bollywood poster of the 1999 action drama written, produced and directed by John Matthew Matthan, starring Aamir Khan Naseeruddin Shah and Sonali Bendre in pivotal roles. Printed and circulated somewhere in the early 2000s, this classic Bollywood poster was printed for publicity of the film but never ended up being used. John Matthew Matthan reportedly spent seven years on making Sarfarosh. The film was a stellar success – winning both critical and commercial acclaim. Sarfarosh won the National Film Award for Best Popular Film Providing Wholesome Entertainment and several Filmfare awards including the Filmfare Critics Award for Best Movie, the Filmfare Award for Best Editing, Filmfare Award for Best Screenplay and Filmfare Award for Best Dialogues. Sarfarosh was also screened at the International Film Festival of India, making this classic Bollywood film poster highly collectible! The film’s music composed by Jatin Lalit was a stellar success. Songs like “Hoshwalon Ko Khabar Kya” sung by Jagjit Singh, “Is Deewane Ladke Ko” and “Jo Haal Dil Ka” sung by Alka Yagnik, and “Zindagi Maut Na Ban Jaye” sung by Sonu Nigam are remembered and played till today. 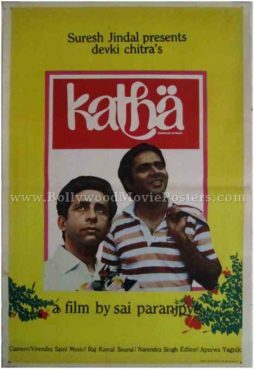 Vintage Bollywood poster for sale of the old Hindi film Katha (1983). This is an actual surviving vintage Bollywood movie poster for sale of the 1983 Hindi film directed by award winning filmmaker Sai Paranjpye that starred Naseeruddin Shah, Farooq Sheikh & Deepti Naval in lead roles. Katha was a beautiful adaptation of the classic Indian folklore of the hare and the tortoise. The film was based on the Marathi play ‘Sasa aani Kasav’ (Hare and Tortoise) featuring Naseeruddin Shah as the tortoise and Farooq Sheikh as the hare. The film was a critical success much like Sai Paranjpye’s other films, making this vintage Bollywood poster highly collectible! Printed and circulated during the original first release of the film (somewhere in the early 1980s), this vintage Bollywood poster was printed for publicity of the film but never ended up being used. This vintage Bollywood poster was originally designed as a photographic collage on a board, giving it a pop art feel. Still photos of the two lead stars, Naseeruddin Shah (the tortoise) and Farooq Sheikh (the hare) are seen against a beautiful yellow background. 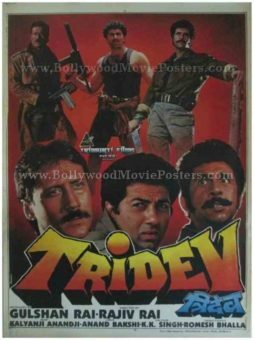 Old Hindi film poster of the blockbuster Bollywood movie, Tridev (1989) for sale. This is an actual surviving classic Hindi poster of the 1989 movie directed by Rajiv Rai starring Sunny Deol, Naseeruddin Shah and Jackie Shroff in lead roles. Tridev was a blockbuster hit and won three Filmfare Awards. Songs from the film such as “Tirchi Topiwale” are fondly remembered and played till today, making this Hindi movie poster highly collectible! This beautiful old Hindi film poster has been designed by the greatest calendar artist in India, JP Singhal and bears his printed signature in the name of his studio “Singhals” on the bottom left corner, making it highly collectible! Printed and circulated during the first release of the film (late 1980s), this classic Hindi poster was originally designed for publicity of the film but never ended up being used. This Hindi film poster for sale features tell tale signs of calendar artist JP Singhal’s artistic sense. Still photographs of the lead actors, actresses as well as the villain are seen in this Tridev movie poster. Classic Bollywood poster of the blockbuster Hindi film, Tridev (1989) for sale. This is an actual surviving classic Bollywood film poster of the 1989 movie directed by Rajiv Rai starring Sunny Deol, Naseeruddin Shah and Jackie Shroff in lead roles. Tridev was a blockbuster hit and won three Filmfare Awards. Songs from the film such as “Tirchi Topiwale” are fondly remembered and played till today, making this poster highly collectible! This beautiful classic Hindi movie poster has been designed by the greatest calendar artist in India, JP Singhal and bears his printed signature in the name of his studio “Singhals” on the bottom left corner, making this poster highly collectible! 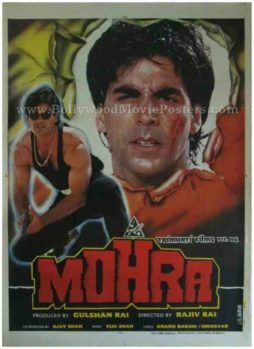 Printed and circulated during the first release of the film (late 1980s), this classic Bollywood movie poster was originally designed for publicity of the film but never ended up being used. This classic Indian film poster features tell tale signs of calendar artist JP Singhal’s artistic sense. Still photographs of the three lead actors appear in symmetry, with close ups at the bottom and full length figures on the top. 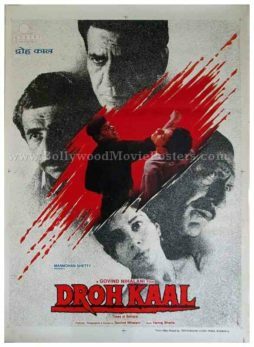 Old Bollywood movie poster of the award winning Hindi film, Drohkaal (1994) for sale. 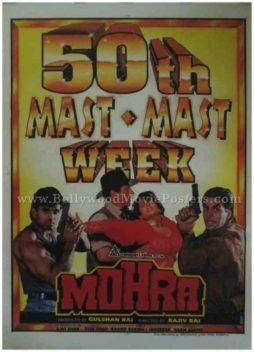 This is an actual surviving vintage film poster of the 1994 action drama that featured two of the most talented actors of Indian cinema, Om Puri & Naseeruddin Shah in lead roles. Drohkaal (1994) is an award winning Bollywood movie that dealt with the sensitive subject of India’s fight against terrorism, making this poster highly collectible! Printed and circulated during the first release of the film (early 1990s), this vintage Bollywood movie poster was originally designed for publicity of the film but never ended up being used. Drohkaal is a 1994 Bollywood movie directed and produced by Govind Nihalani starring Om Puri, Naseeruddin Shah and Ashish Vidyarthi in lead roles. The film describes the battle between the police and terrorists. The success of the movie inspired a subsequent remake in Tamil starring Kamal Hassan, called Kuruthipunal. The film gave Ashish Vidyarthi the National Film Award for Best Supporting Actor and Govind Nihalani the Best Director Award at the Damascus International Film Festival. 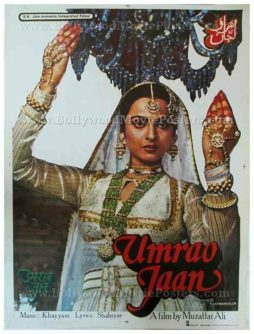 Beautiful photographic vintage Bollywood movie poster of the award winning Hindi film Umrao Jaan (1981) for sale. This is an actual poster of the 1981 film that featured Rekha in the lead role, playing the character of a courtesan. Printed and circulated several years after the first release of the film (somewhere in the 1980s/1990s), this movie poster was originally designed for publicity of the re-release of the film but never ended up being used. In this vintage Bollywood poster, the lead protagonist of the film, Rekha is seen in her spectacular best in an iconic dancing pose. A large cut out of Rekha from a still photograph has been pasted on a blank background. The typography used in this poster is primarily in English, with only the title translated in Devanagari Hindi as well as Urdu. Umrao Jaan is a 1981 award winning Hindi film based on the Urdu novel Umrao Jaan Ada that tells the story of a famous courtesan. The film starred actress Rekha and Farooq Shaikh in lead roles. The soundtrack of the film went on to become a rage throughout the nation. Composed by Khayyam, several songs from Umrao Jaan are considered the greatest ever penned in Bollywood. “Dil Cheez Kya Hai” and “In Aankhon Ki Masti” in particular are played till today. Umrao Jaan went on to win several awards at the National Film Awards, primarily for its music. Rekha bagged the award for best actress of the year for her lead role in the film. Following the success of the film, a remake was released in 2006 starring former Miss World Aishwarya Rai as Umrao Jaan.